While I was up in York Harbor for the weekend I took the opportunity to visit Historic New England’s Hamilton House on Saturday afternoon while everyone else was at the beach. I’ve been on a historic-house museum kick this summer, and while I’ve been to Hamilton House (in neighboring South Berwick) before, it merits repeated visits if only for its setting and gardens. It’s the perfect Colonial/Colonial Revival House, built in the earlier period (c. 1785) by new money and “restored” with not-quite-old Boston money at the turn of the last century. In between, it was a working farm, with hay in the attic and tenants on the first floor. After it was acquired by Historic New England in 1946, it was returned to its original appearance on the exterior, but the Colonial Revival summer house interiors were retained. Hamilton House today and in John Mead Howells’ classic Architectural Heritage of the Piscataqua (1937)+ a Charles Woodbury illustration of the house, the setting for Sarah Orne Jewett’s The Tory Lover (1901). South Berwick native Jewett apparently convinced her friends Emily and Elise Tyson (Vaughan) to buy the derelict house for their summer retreat. The Tysons had sold their former summer house in Pride’s Crossing, Massachusetts to Henry Clay Frick, who promptly knocked it down. Because it was a summer house, there’s more than a bit of incongruity between the furnishings and the architecture: the former is genteel “shabby chic”, early twentieth-century style, and the latter is quite grand, especially the large central hall. The straw matting running through the house contributes quite a bit to this rambling mix. While obviously I am a Philistine when it comes to the interior of Hamilton House, it is much appreciated by others, and was also quite influential in its own time, as explained in this great post over at the Down East Dilettante. I did appreciate how its interiors related to its setting, poised as it is over the Salmon Falls River with gardens, fields and forest also in view, and the rather charming Zuber-esque murals of Portsmouth artist George Fernald Porter. First floor parlor, murals and dining room, and the requisite open hearth in the kitchen. The summer furnishings also make the house feel very airy, particularly on the second floor. If the Tyson ladies found anything remotely Victorian in the house when they took possession, I am certain that it was banished immediately! As we ascended upstairs, we could see an exposed beam which was repurposed by the house’s builder, Captain Jonathan Hamilton: when he didn’t need it for one of his ships, it was used for his new house. Just three of Elise Tyson Vaughan’s vast collection of dolls: apparently the remainder are in the Peabody Essex Museum. It’s impossible to search its vast collections so who knows? The Tysons moved an adjacent barn and laid out an enclosed garden of “colonial” flowers surrounding a sundial and fountain and extending to a garden cottage composed of salvaged doors and planks from a first-period house across the river: a shady respite from the summer sun but at the same time open to its environs. As you can see, it’s the season for phlox, which surely must be the perfect Colonial Revival perennial. I was moving very slowly on Wednesday morning and so was still at home in the late morning when all sorts of sirens went off on Chestnut Street and three firetrucks charged in, accompanied by several police cars.The entire street was blocked off, and then a huge ladder truck arrived from Lynn (apparently there was a simultaneous fire in Salem so we needed aid). 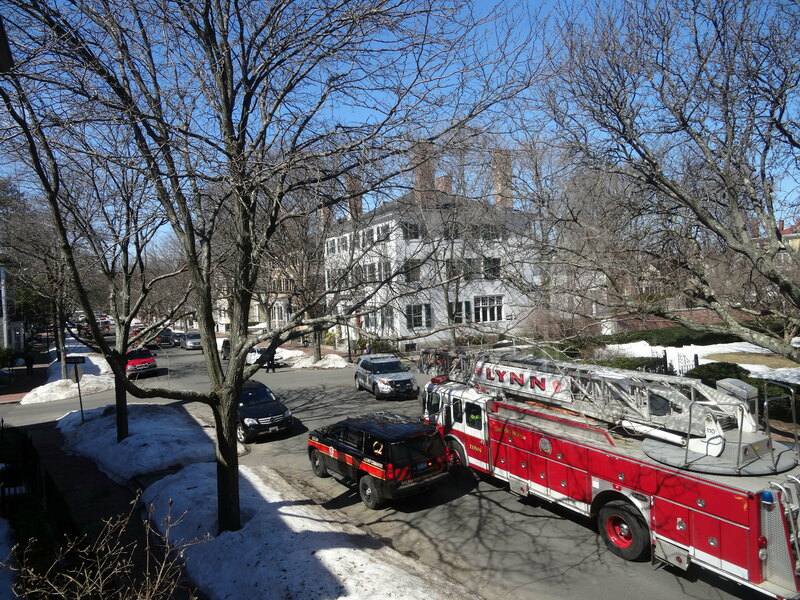 The object of everyone’s attention was a roof fire at #12, the Jonathan Hodges house. I saw no fire (or even smoke) myself but apparently the contractors who were working on the roof–welding, I suppose–saw or smelled something, and so they called the Fire Department, which of course was absolutely the right thing to do. 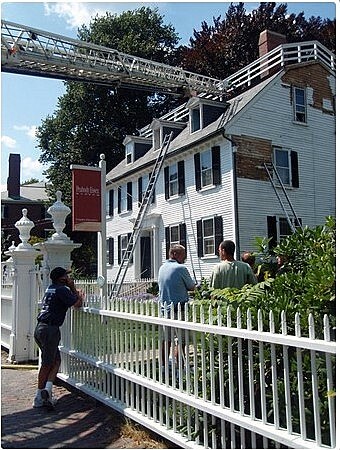 Once the ladder was extended to the top of this very large house, one firemen ascended to its end and started pounding away on the roof, which caused me to gasp, because after all this particular house is a Samuel McIntire house, in fact the only one so-documented on the street, and no one likes to see such a treasure attacked. But an attack by fireman is much, much better than an attack by fire, certainly. After a few minutes (maybe 15) everyone seemed satisfied that there was either no fire or it was out, and all the firemen and policemen left and the contractors went back to their work. 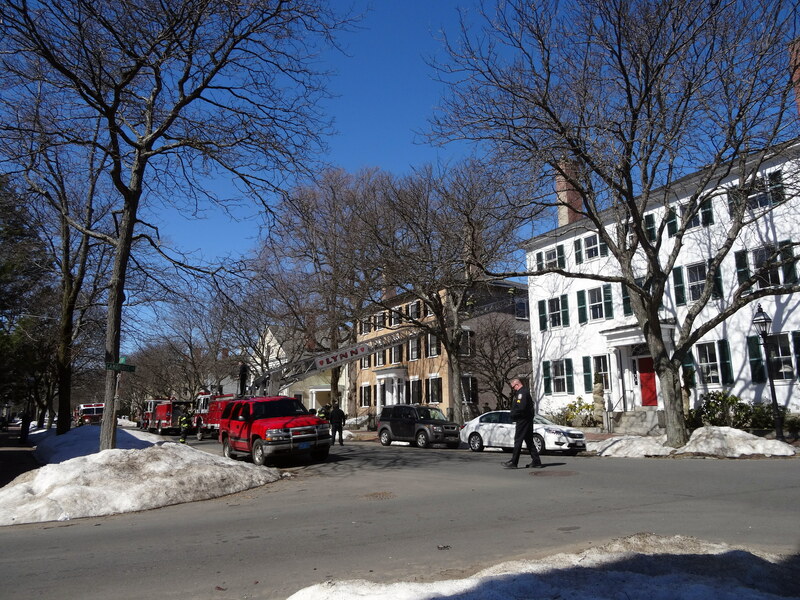 A calm descended on the street almost as quickly as the alarm. The Jonathan Hodges house is three doors down from mine across the street; diagonally across is the Chestnut Street park, which used to be the site of another magnificent Samuel McIntire building: the South Church, built around the same time (1805). This towering building, with its 150-foot steeple, was completely consumed by fire one night in 1903: I can’t help wondering what would have happened if that huge ladder truck had been available then. But that’s a pointless exercise. 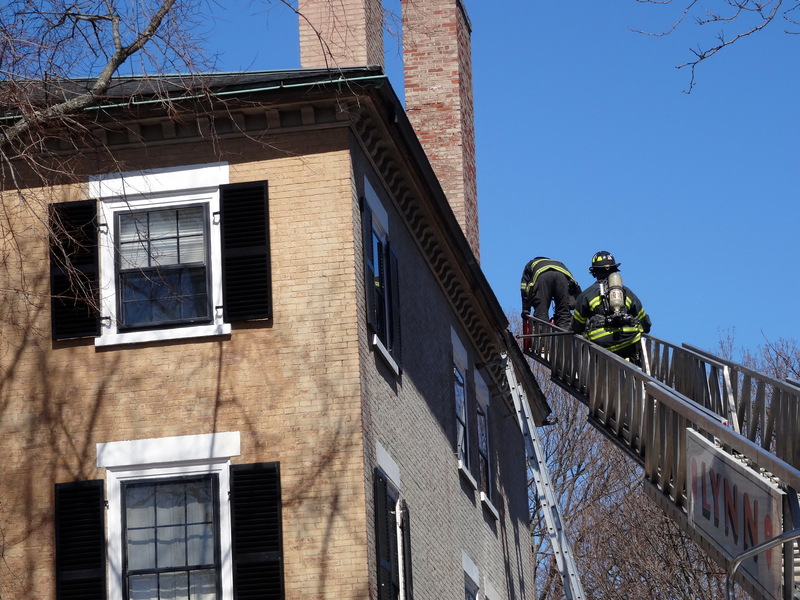 On a much happier note, in 2009 (on a hot, muggy day I remember well) a fire broke out in the historic Ropes Mansion on Essex Street when contractors were on the job: another rapid response by the Salem Fire Department saved the house from any serious structural or water damage, though the attic floor was charred, and a single crystal water pitcher broken. 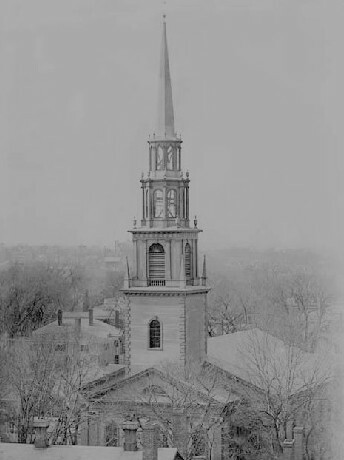 The South Church on Chestnut Street in Salem, before 1903, from the McIntire microsite at the Peabody Essex Museum’s website; the Ropes Mansion fire of 20009, photograph courtesy of Frank Cutietta.